While human resources is sometimes considered a support function in organizations, it is the one that builds and sustains all other departments and teams. According to a Glassdoor survey, only 49% of employees actually recommend their company to friends and family, while 69% would not take a job with a company that had a bad reputation, even if they were unemployed! This points to the fact that your HR team not only hires and retains, but also builds a place that people would want to go to everyday. And building such amazing places is not easy. Especially when it involves anywhere between a handful to a few hundred thousand people. According to a 2015 study, it takes an average of 52 days to fill an open position, up from 48 days in 2011. With a dozen new processes and a high applicant-to-hire ratio, recruitment only gets tougher and slower. 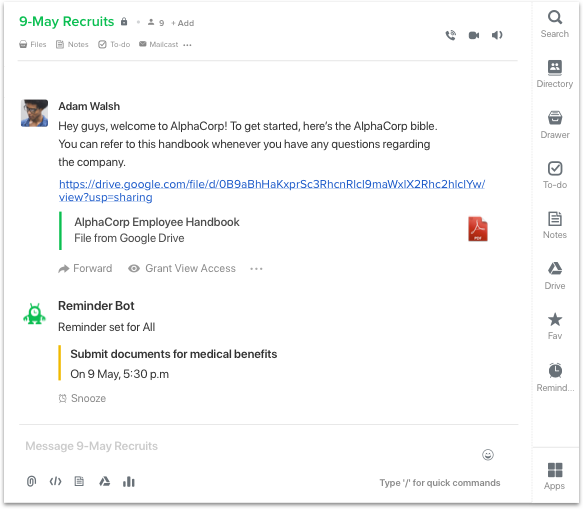 Here’s how you can manage your entire recruitment process in Flock, with speed and ease. You can work on your recruitment strategy and needs in one place by creating a Flock channel and inviting all relevant stakeholders such as HR and Finance teams, managers and recruiters. Use the space to discuss talent requirements, and budget allocations and timelines. Flock Tip: You could name this channel Recruitment Needs so that everyone knows what the channel is for. Next, set up a channel to finalize on the job descriptions, platform and means to publicize the job, and get started on candidate search. Jot down your JDs via Flock Notes and share them in the channel. Once you’ve started receiving applications and have filtered applicants, you can set up one channel per applicant to plan interviews. You can add your hiring managers, recruiters, and all the interviewers to this channel. Plan the interviews with To-Dos and assign them to the respective interviewers, with due dates. Share the applicant details in the channel and pin them to Files, so your team finds the documents quickly. Once an interview is done, the interviewer can share their feedback with the rest of the team and the hiring manager can finally decide if the applicant should be offered the job. Great, everyone likes Alison! Now it’s time to make the offer. You can draft Alison’s offer letter and discuss the nitty gritties like package, benefits, etc with the same group of people. Now all you have to do is make the offer, get a thumbs up from the candidate, and call it a day! Traditionally, new recruits were taken around the office and introduced to a few departments after which they’d end up at their desks with books and brochures with details on the company culture and policies. But with advances in technology, onboarding processes now start even before the new recruit joins the company. And it’s vital that we get this piece right: New employees who are part of a well-structured onboarding orientation program are 69% more likely to remain in a company for up to three years and have shown an increase in performance up to 11%. 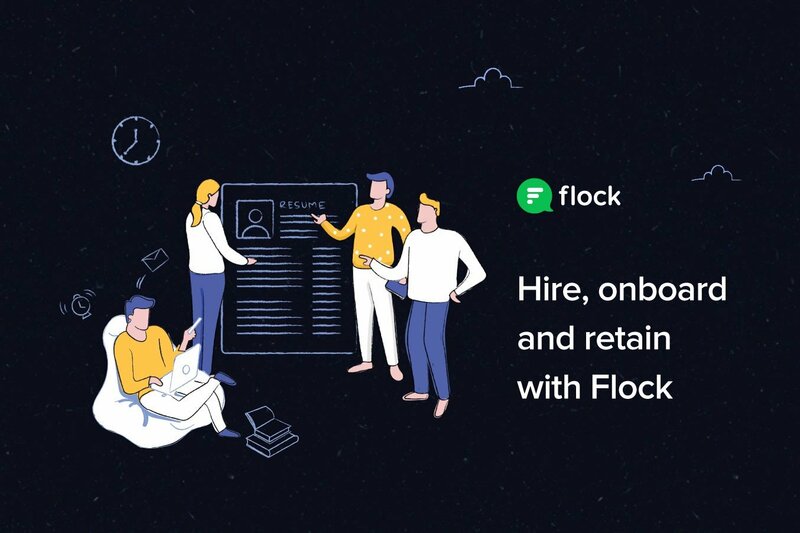 Here’s how Flock helps: A week before your newbies join the office, create a channel, say New Hires_9th May for all the new recruits. Add all your HR representatives such as comp & benefits executives to the channel. Ideally, you could keep the channel active for about 2 weeks to a month until all the new recruits have familiarized themselves with the company. Encourage your new employees to ask you anything in this one place — from lunch coupons to succession planning. Share company documents such as FAQs, employee guidelines, benefits, etc. as Notes and pin them to Files for quick access. Make sure the new recruits share their documents on time and register for benefits before the deadlines. Set reminders for them with Flock’s Reminders tool or the Google Calendar integration. What gets measured, gets improved, and that includes employee performance. Most companies consider performance reviews as a task to finish more than as a necessary step in employee and organisational growth. And more often than not, this is because of tedious process and too many files and emails. Set up a channel with your HR and department managers to brainstorm on the parameters to review individuals against. Finalize the parameters and share the review sheet in Flock. 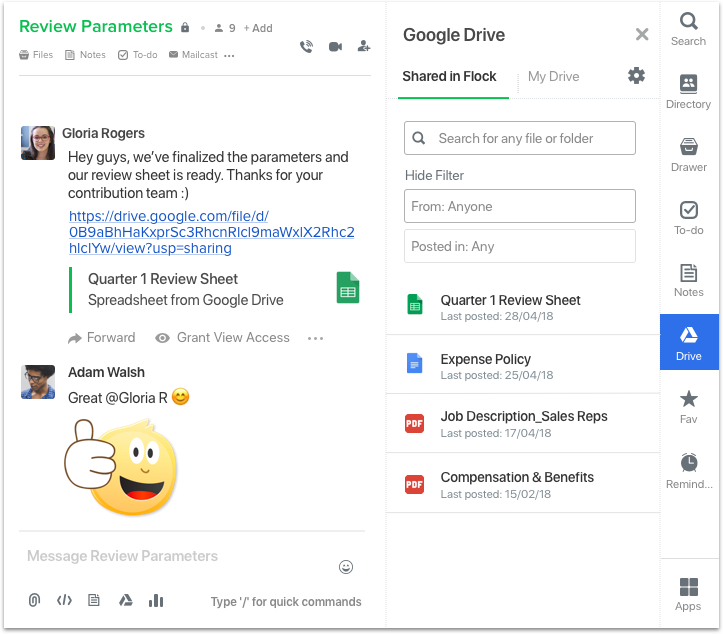 Flock Tip: It’s easier to collaborate on such documents if you host them on Google Drive. 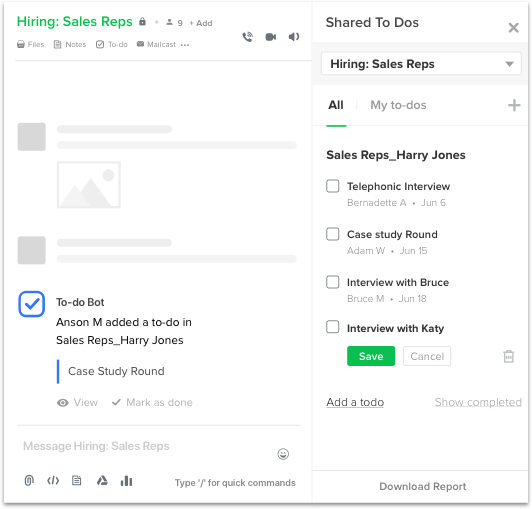 With Flock, you can share all Google Docs with your team and manage access permission from within the app. Assign departments to HR representatives. Manage reviews with Flock’s Shared To-Dos app. Set the reviewee’s name as the list name, and jot down all the steps in her review. Set realistic due dates to complete each step. Once each step in the review is completed, mark it as done. Conduct the feedback session and take notes of the discussion via Flock Notes. Share a final consolidated note with the HR Manager and Department head. For remote teams, coordinate via video conferencing in Flock. Businesses today need to be people-based in order to survive, evolve, and thrive. They should encourage effective team collaboration and communication between agencies and clients. 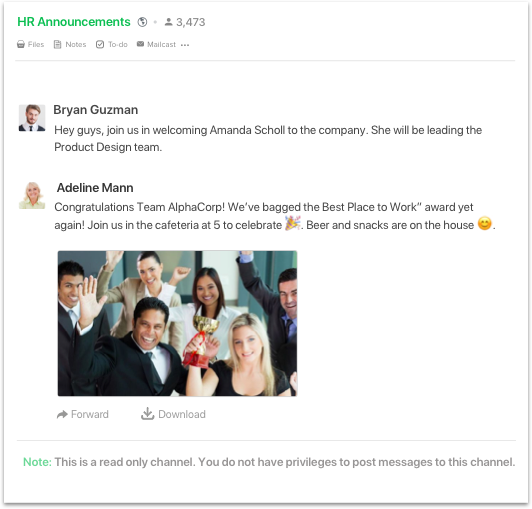 Set up an Announcement channel to share important updates such as changes in HR policy, appointment of a new team manager, etc. To answer queries following an announcement, move the conversation to personal chats as announcement channels only allow the channel admins to post in the channel. This makes sure that your entire team isn’t bothered by the continuous ping of emojis and questions. Encourage your team to create channels of their interest and connect with coworkers outside their immediate team. Eg: a Buy & Sell channel to trade personal items within the company, or a channel for serious coders who want to to disrupt technology. Share appreciation for a team member in a company-wide channel and let all the applause follow there. Use emojis and have your team reply with reactions like and , stickers and gifs. Keep it fun for everyone! You candidate information in Flock is secure. Your work gets done faster, as processes are streamlined in Flock and information on project status is easily available in channels. Ready to try Flock? Download it here for free!